not at all familiar with. In this article, he’ll share some secrets to finding walleyes on “New” water. As a professional walleye angler, I have accumulated over three decades of tournament fishing experience. With all that time on the water, I face the same challenge many of you do each and every season … finding walleyes where I’ve never fished before. Since my livelihood is based on catching fish, I believe I have learned a few things that can help you deal with this age-old challenge. A little research will go a long way to helping unlock the walleye mystery of a new fishing hole. First thing to do is get a map of the lake, river or reservoir you’re targeting. Study the layout … look for types of structure most likely to hold fish for the time of year you are planning to be there. Familiarize yourself with the names of bays, landmarks and islands. Locate distinguishable areas such as large weed beds, major points and incoming rivers or creeks. With this basic knowledge, you are ready to start gathering recent fishing reports. The most obvious places to start are in the local bait shops. To get the right information, you need to ask the right questions. It’s easy to ask a shop owner “How’s fishing?”, but that doesn’t really get the info you need. 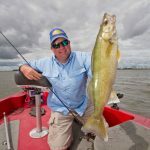 To find out the true “scoop” about what’s going on, there are some very pertinent questions that need to be answered, like; “What’s this lake’s main forage?”, and “What areas have been producing the best walleye catches lately?” and “At what depth are most of the fish being caught?” . Walk around and look at the store shelves. Pay attention to the types of lures the shop owner is stocking … this will give you a good idea of what most local anglers are using. Get your map out and ask to have some key areas pointed out … popular places that might be a good place to start. In this way you will get a good idea of the type of structure that is producing walleyes at that time. Now you are ready to hit the water … but there’s still research to be done before you are ready to wet a line. You have your map marked with the local “hot spots”, you’re stocked with the right bait or lures, the boat is gassed up, and you’re ready to go catch fish … almost. If you’ve ever headed out on a strange body of water and tried to navigate with nothing more than a paper map you know that it’s not always as easy as it seems. It’s easy to get confused and disoriented when faced with an endless shoreline of points, bays and/or islands. “Is that the point the guy said to fish, or is it that one over there?”. Here is where modern technology can save the day. GPS (Global Positioning Systems) have become as much a part of a serious walleye angler’s arsenal as rods and reels, and for good reason. With a GPS mapping unit like the Lowrance GlobalMap 7000 or a sonar/GPS combo unit like the LCX-26C HD, you will always know where you are. These types of GPS units feature built-in maps as well as the capability to build custom maps of specific areas, so by comparing your current position on the screen of your GPS with the information marked on your paper map, you’ll have a much easier time finding those elusive hot spots. By using the unit’s plot trail feature, you will also be sure to find your way back the boat ramp at the end of the day … not always an easy thing to do on an unfamiliar body of water. OK, you’re on the water … you’re in the right spot … now let’s find the fish. You’ve heard us preach this before and no doubt you’ll hear it again … fish where you find fish. Cruise the area while keeping your eyes on the fish finder. Look for signs of life such as clouds of baitfish, or the tell-tale “arcs” that indicate larger fish. If the walleyes are inactive, they may only appear as “bumps” on the bottom. A quality locator like the LCX-26C will have the power and resolution to give you the kind detail and seperation to spot those bottom hugging walleyes as well as fish cruising off the bottom. In any case, if you see no fish, move on. Check out the nearest, similar structure and repeat the procedure. When you mark fish, choose your presentation by how they show up. If they’re up off the bottom, assume they are active and try something like bottom bouncers and spinners trolled through the area to catch them. If you’re marking fish scattered along a long piece of structure like a large flat or extended breakline, you may even choose to troll crankbaits to contact them. Fish showing up as “bumps” on the bottom are going to be tougher to trigger, so slow presentations like jigging or live bait rigging may be called for. Catching walleyes (or any fish for that matter) on unfamiliar waters is a process. Take the time to do your homework, shake a few hands and don’t be shy about asking the right questions. Someday someone will come along and ask you “How are they bitin’?” … and you can return the favor.